In this episode of The Maritime Outdoorsman, Dave talks about the NOT so great outdoors. After telling about his encounter with a blood infection caused from a leech bite, Dave talks with Kathryn Maroun, host of the TV show ‘What A Catch’ about her personal battle with Lyme disease. The intent of this episode is to help spread awareness and promote prevention of bug born illnesses. Casting For Recovery Canada – Casting for Recovery Canada provides fly fishing retreats coast to coast in Canada. Our retreats are specifically designed for women who have or have had breast cancer. 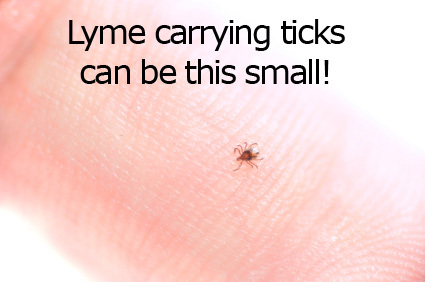 IGeneX – Better understand laboratory assays for Lyme and other tick-borne diseases. Cure Unknown – A groundbreaking investigation into the medical history, patient experience & brutal political war over Lyme disease. Under Our Skin – Extended Trailer – In the 1970s, a mysterious and deadly illness began infecting children in a small town in Connecticut. Today it’s a global epidemic. Episode 006 – Continued discussion on ticks & Lyme Disease – Vett Lloyd interview. This is a very educational podcast and it is horrendous that anyone has to suffer from this. She is a strong woman to have put up with this and now speak out. Keep this information in mind when you head out on the water or through the brush. It would be a horrific loss to take away the one thing that gives so many solace because you contracted lime disease or any other illness. Thanks for listening Darrin and for your feedback. Please share this podcast episode with anyone you can. Thank you Kathryn for spreading Lyme Disease Awareness by doing this interview. People don’t realize how serious this disease is. It’s very hard to diagnose and even harder to treat. Thanks for getting the word out! Kathryn Maroun is a friend of mine since I attended one of her Casting for Recovery trips a few years back. What a remarkable lady. Listening to your podcast just now was a real ‘eye opener’ into Kathryn’s journey, but also into our Canadian Health System. I would really like our Federal Health Minister to hear (and I really mean HEAR) her story. I’m not sure how this may be possible, but could a copy of your interview with Kathryn be sent to Ottawa? Thanks for listening and for your comment Alison. The great thing about this podcast is that it can be listened to via iTunes, Blackberry Podcast Network, Stitcher Radio, and even right here directly on this website, by anyone who has a sound capable device. We hope the word spreads and that the Federal Health Minister takes the time to listen as well. Thank you for spreading awareness of Lyme disease and the devastating effects of the disease. I have been sick with Chronic Lyme Disease for six years. I didn’t have a bullseye rash, didn’t know I was bit and therefore I went undiagnosed for three years. At my worst, I have been unable to walk, severe cognition problems, seizures, and bedridden. I tested three times in Canada and all were negative and yet I test positive in the U.S. I have spent my hard earned life savings on treatment in the U.S. that I have been denied in Canada. It has been an extremely painful, agonizingly slow semi recovery that I may never recover from. There is a lot of misinformation on the internet regarding Lyme. If you would like correct, up to date information on Lyme disease and the controversy surrounding it, please see http://www.canlyme.com. Very sorry to hear of your condition. Thanks for listening and for sharing your story. All the best with your continued battle. Thanks for sharing, the public needs to know the truth about Lyme disease.. there is this distorted view that Lyme is easy to cure and is no big problem when that is furthest from the truth.. Lyme left undiagnosed and untreated can cause a lifetime of hurt and leave people hopelessly sick for the rest of their lives.. Thanks for listening John and for your comments. When I look out the window of the plane onto the vast nothingness below, I wonder where all the people went? I mean their bodies, when they passed away? So many people have lived before me, and yet there is no sign that they ever existed. I conclude that they are the dust that I wipe off the dresser from time to time. We are all so busy doing and gathering that we blast through the years before realizing that middle age has struck us down in our prime. Each day is a blessing, a kernel of potential and promise. Yet we plow through them as if through a bucket of buttered popcorn while we wait for the movie to start. I bet you can’t even remember where you were and what were you doing on Feb. 19, 2013? Intrigued, I decided to poll some of my friends. Thirty percent could not remember what they were doing five days ago. But the ones who could remember reported this to me: Moirajeanne from Pennsylvania painted the front of her shop, From Here To Timbuktu. Bill from California was “taking care of some business affairs.” Michael wanted to know what he had missed. Barbara was in Rolla, Mo., “writing like crazy, catching up on an extended deadline.” Was this a good use of time? You may be surprised to learn that people spend more time in bed than they do participating in sports and leisure activities. This doesn’t seem right. I would much rather be on a river in the Gaspé region of Quebec, angling for Atlantics, than sawing logs. So are you wondering what I was doing on Feb. 19, 2013? Not likely, but I’m going to tell you anyway. I was at yet another doctor’s appointment getting all “pilled up.” Definitely a waste of my time! I battle Stage 3 neurological Lyme disease and co-infections, a chronic affliction that will result in an early death because of improper treatment of the infection(s) that are transmitted by the bite of a single tick. You may be surprised to learn that in most places globally (and yes, it is a global plague) it is illegal to treat this vector-borne illness with more than four to six weeks of antibiotics. A slow, tortured death is what will follow partially treated Lyme, as the spirochetes eat me from the inside out. This is, after all, the cousin to syphilis. Corkscrew spirochetes permeate every organ in the body. It is madness that I was given a year’s treatment for acne with the same drugs that are illegal to prescribe for the treatment of late-stage Lyme disease (the same antibiotics used for treating syphilis). This is, after all, the preferred treatment against the plague of our time. It is beyond comprehension that I would be denied access to the only hope I have of getting well. Some people did make good use of their time on Feb. 19, 2013. They met in Virginia to pass a bill that would make it possible for doctors to treat tick-borne illnesses without fear of prosecution. This (along with inadequate testing) is why Lyme is underdiagnosed and improperly treated. Bill 1933, aka the Virginia House of Delegates Senate Lyme Disease Testing Patient Disclosure Information Bill, states that a negative Lyme test does not mean that you don’t have Lyme disease. This information will make it possible for doctors to treat patients based on symptoms. In some states it is even possible for doctors to treat Lyme for longer than four to six weeks without fear of losing their licenses, as so often happens elsewhere. That is why Lyme is underdiagnosed and improperly treated. That is why I’ve spent the last three months holed up in a fleabag hotel off the highway in California, rather than being surrounded by friends and family at my home in Bermuda. You see, California, Connecticut, Massachusetts, Minnesota, New Hampshire and Rhode Island are the only states that have changed laws to make it possible to treat late-stage Lyme disease. Before these new laws were penned, doctors could be thrown in jail for giving Lyme patients more than six weeks of antibiotics. Their medical licenses could also be revoked. If you or a loved one lives outside this safe zone and are dealing with untreated Lyme disease, you will suffer a similar fate to all those who came before you. Bugs that bite are nature’s dirty needles. The politics of Lyme disease is a cancer. Make good use of your time today and get up to speed on this important issue. It may save your life or the life of someone you love. You may be moving to the Golden State. Good fishing here. Thanks for raising awareness of this dreadful disease Lyme Disease – even though in it’s early satges it is an easily treatable disease with antibiotics all health Authorities have their heads in the sand and there is such a lack of public awareness hence doctors do not recognise the classic signs of Lyme Disease. It took 5 doctors and 3 Consultants 4 years to diagnose me even though I attended sugery at times of bites, bulls eye rashes and migrating arthritis before a chronic and debilitating arthritis and muscle weakness set in. As I deteriorated I was diagnosed with Fibromyalgia, ME/CSF, Musculo Skeletal Disease, Polymyalgia Rheumatica but a chance course of antibiotics significantly improved my symptoms and led my GP to suspect Lyme Disease – on antibiotics symptoms improved but once antibiotics stopped symptoms deteriorated. Thankfully I found a doctor privately who was knowledgeable about Chronic or Late stage Lyme disease and with the support of these two doctors I continued on several years of antibiotics recovering to near normal with a good quality of life no pain no arthritis and no muscle weakness. Now two years after treatment I have some symptoms returned but once again these improve on antibiotics – getting doctors to understand this complex disease and prepared to treat long term is again proving difficult. In UK chat line Eurolyme has 2500 members all struggling to get appropriate treatment – in an odd way they are the lucky ones they know what their diagnosis is, what of all the other thousands of patients with diagnosis like mine and many others who are currently treated on steroid drugs to suppress their immune system and although it appears to ease the inflammation it actually allows the bacterial infection to get a greater hold in many systems in the body.Not all will have Lyme Disease but with current tests so abysmal and doctors so lacking in diagnostic skills and in denial many people with Chronic illnesses may never know that the underlying condition could be Lyme Disease or one of the many co infections passed on by biting insects or ticks. Thank you for helping to spread awareness on what bas become an epidemic. My daughter and I both have Lyme Disease. Most people and most doctors have no idea what we are up against. The CDC and the IDSA are misinforming doctors, making it so much harder to get diagnosed and treated than it should be. People are suffering and people are dying. Spreading knowledge and awareness is the first step in trying to change things. Quick question, do you know if she finished the show she had mentioned at the end of the interview? I would be very interested in seeing it. Thanks again! Thank you so much for doing a show on Lyme disease. Unfortunately the majority of us are in Kathryn’s situation and are continuing to decline. I was misdiagnosed for years and ended up giving it to my two little girls, who are also both very ill. We are slowly losing everything trying to get treatment so we don’t die from this horrific illness. Doctor’s in my state will not treat my children or I, so we have to drive to a different state to see a Lyme literate doctor. Even though we have health insurance we are forced to pay for all of our Lyme related medical costs out of pocket because doctors are afraid to lose their licenses for treating people properly with Lyme disease. I used to be a productive person in life and now I can’t even take care of my two sick children who are now 2 & 4 yrs old. I really can’t thank you enough for spreading awareness of this deadly disease. Just wrote a lengthy note on this but apparently I put the wrong “captcha code” in and that was the end of it! Short form is I am happy that you are helping to raise awareness of tick borne diseases. I live in Nova Scotia, have been clinically diagnosed with tick borne diseases (by a Nova Scotia physician who is now off on stress leave) and have also been trying to raise awareness via my facebook pages on Lyme and Vector Borne Diseases and my Scoop.it page on Lyme & Associated Tick Borne Diseases. I have also had an ongoing letter writing campaign with the Minister of Health, the Chief Medical Officer of Health, Doctors Nova Scotia, the College of Physicians and Surgeons of Nova Scotia and the Nova Scotia College of Family Physicians. I have been interviewed a few times and I have organized Lyme Information Meetings. However, Dr. Strang (Chief Medical Officer of Health) and the Minister of Health both still tell me contracting Lyme disease in Nova Scotia is rare (yet I can name approx. a dozen people in my community alone that have been diagnosed with a tick borne disease). Knowledge is power and having people realize that there is a change of getting a tick borne disease just about everywhere in the province will help to ensure that they take care of themselves! Thank you again. I am with a Lyme support group, Thank you for sharing your story to get the word out about Lyme. It seems that the public believes that it isn’t going to happen to them and this is just some rare disease that some of us are getting. What the public doesn’t understand is some experts believe that most people have Lyme is some way or another and don’t know it. It’s all about keeping your immune system up. Part of the problem is all the GMO foods and processed foods with so much chemicals in them. They are bringing our immune system down so our bodies can no longer fight bacteria and parasites. I have actually been fighting Lyme and coinfections since last August but in going back through my life, I’ve probably had it since 4 years of age. Like Kathryn states the symptoms are not always so subtle and not everyone remembers a tick bite. Some patients may go to their doctor one week for a pain in their shoulder then the next week go because of an upset stomach. Everyone’s symptoms are different because it all depends what they are infected with and where the bacteria is attacking. The tests are totally unreliable. Even if a doctor tells you that your test is negative… you may still have it. If your symptoms continue then keep getting tested every few months. The bacteria likes to hide and isn’t always in the bloodstream and also as Kathryn stated when you are first infected, your body doesn’t always make antibodies right away. The tests do not look for the bacteria itself, it checks for the antibodies. There are also over 300 different kinds of borrelia bacteria… in the US, there is about 100 and the tests do not look for all of them. You must be your own advocate. Also, one thing that was not discussed is Lyme is called the “Great Imitator”. Lyme has been proven… through peer review studies… to mimic over 300 chronic diseases such as MS, ALS, chronic fatigue syndrome, ADD, fibromyalgia, Autism, rheumatoid arthritis, Alzheimers… I even heard Kathryn mention diabetes… these are just some of them. Dr. Klinghardt, another famous Lyme literate physician stated that it is now known that every chronic condition or chronic disease is caused or at least attributed by a chronic bacterial infection… it’s not always the borrelia burgdorferi which is the bacteria that causes Lyme but it can be another bacteria. If you would like more information and read more stories. You can find us on Facebook – Kentuckiana Lyme Support Group. One more thing I would like to add is you want to get that tick out as quickly as possible. We tell people to use tweezers and if you don’t have tweezers, use your hand but use a tissue. Just get as close to the head as possible. The longer you wait to get that tick out, the greater risk you are taking of getting it’s pathogens. We have heard of patients only having a tick embedded for just a couple hours and still were infected. Don’t take chances! Thank you for helping us spread awareness. I was a hard worker since age 13 up until 4 years ago at age 32 when as full time successful upper manager and full time college student I became disabled. I am pretty tolerant to pain but Lyme disease is horrible and the pain are indescribable. I have lost everything, went bankrupt, live with my parents, haven’t driven a car in 4 year and probably leave the house 3 times a year usually to go out to eat for an hour. All of this is thanks to Lyme disease which I have had since age 6 (30 years). Some of the things I suffer from: Chronic or Late-Stage Lyme Disease, Bartonella, Babesia, Lupus, Fibromyalgia, Chronic Fatigue (CFS), Mycoplasma, C. pneumoniae, intestinal parasites, Epstein Barr Virus (EBV), Radiculopathy/ neuropathy, herniated Discs in my neck C5-C7, chronic Knee pain (non-lyme), Spinal Stenosis (neck), Hypothyroidism, carpal tunnel, Insomnia, IBS and still testing for more. Many of the above were all caused by a few tiny ticks bites which at the time I thought were innocent. So I ask that when you go outdoors always check yourself and you children… for ticks. What you read on the Internet such as the CDC web site is all false information. Lyme is not an easy cure, doctors could care less, insurance covers nothing and everyday is a living hell. The later it is diagnosed the worse. Thank you for this article. Thank you for informing people about this risk! I have the same feelings as the host: I just want to stay away from the outdoors forever. However, this will not happen because I love hunting and being in nature. Dave: what can be done to prevent getting ticks? I’ve heard of special pants and whatnot; could you do a piece on how to minimize the risks? Great podcast ,but sad to here about Kathryn. I bought a cottage just outside Weymouth last March and 4 of us guys went fishing there and for the weekend ,our tick count was around 30 .So this podcast #5 has certainly been an eye opener to me . I was diagnosed with Lyme Disease in the summer of 2005, 3rd phase.I was very ill, bedridden for a month and the pain in my knees had me begging my husband to cut off my legs. I was given a prescription of Oral Doxycyline by my family practitioner. After getting very sick from the medication doing its job, I finally began to feel better. The following spring (2006) I went back to my family practitioner and told him I felt “Lymey” He did not send me for a blood test, instead tried a few alternate therapies. I had already begun studying this disease and found the “Tick Born Disease Center” in Philipsburg, NJ. They did the correct tests and they came back positive along with a several Co-Infections. I was put on intravenous doxy and other medications all at my cost. About 3 weeks into the intravenous treatments, I suffered an aneurism followed by a stroke. The hospital continued my treatments while I lay in an induced coma for a month. My hospital stay in intensive care lasted a month and a half. Due to the Lyme and the Stroke, I lost a very good job and had to apply for Social Security Disability. On February 16, 2009, I went to my family practioner complaining of extreme knee pain. He sent me for an x-ray and bloodwork. On my return visit on the 24th, the x-ray showed nothing wrong, the bloodwork showed Lyme. I was prescribed 100 MG Doxycyline twice a day for 30 days. Since that time I have been on oral doxycycline 5 more times. The last time, this past Spring(2010) I was on doxycyline for 4 months when I just couldn’t stand the yeast anymore and went on an herbal protocol. Within just a few weeks, I was able to walk without the use of my cane, a week later I actually walked 1 mile to the local strawberry patch, picked strawberries and walked home. I was elated. Unfortunately this new found energy was short lived, I was re-infected just a few weeks later. I tend to flare in the Spring but this past winter 2010-2011, has been the worst so far. The pain has been overwhelming, I spent most of December moving from my bed in the morning to the sofa (heating pad in tow). To top this off, a recent dental appt. with my lyme literate dentist has revealed that the lyme and/or doxycyline has ruined my teeth and I must have them all removed. I went to my appt. with the oral surgeon on March 3rd to have them all extracted. Because of my weakened immune system and the risk of infection I was prescribed Doxycycline, good to fight infection but not good when you have Chronic Lyme Disease. My doctor and herbalist both told me what I already knew, that taking the antibiotic will bring me out of remission. So on top of the pain from the surgery I had to endure a herxhiemer. It was hell, and all these years I thought I was already living it! I am now back on my herbals to fight the Lyme. I am halfway through the regimen, have suffered the herx and now just trying to get by. I’ve gotten used to the daily regimen of cleaning my gums and inserting the dentures. On the morning of June 15, 2011, I woke to find a fully engorged tick in my bed, I knew immediately I had been infected again. Went to docs, transdermal screening detected Lyme and the co-infection bartonella, 21 days of doxy then I began the herbals. Insurance covers neither the screening or the herbs but the screening is more reliable than the blood tests and the herbs have been the only thing that has gotten me to remission. Thanks for listening and sharing your incredibly unfortunately story Bambi. Take care and I hope you feel better soon. Thank you Dave, I have been feeling quite well the past several months, but its Spring again and reinfection is hard to avoid. Along with everyone else, i want to say THANK YOU for the support, for the VOICE you are giving us. My story is so similar to others here. This is the 10 year anniversary of my first lethal tick bite. It caused flu symptoms, but was different than the flu. I got better until uterine fibroids showed up about a year later. After the hysterectomy, the real Lyme symptoms showed up. For a few years my LLMD kept trying different antibiotics and i kept coming up with allergic or severely adverse reactions. Since then i’ve been reinfected twice. For the past 6 years, i’ve been on an herbal protocol which works for me. I’ve experienced remission a few times fully expecting to stay well, but no, i got sick again. Presently, i am going from bed to couch each day. My plans are gone. God and i are very close and i just hope to leave this world soon…. i am so homesick. Thanks for listening Ellen and for your comments. I hope your symptoms ease off soon and that you experience remission again. Take care.